After being closed for more than two months, Rathbun’s will reopen September 23 at 5 p.m. The restaurant has been “brought back to life,” says owner and chef Kevin Rathbun, after a small kitchen fire broke out on July 4. Rathbun, who also owns Kevin Rathbun Steak, Krog Bar and KR SteakBar, revamped the ten-year-old restaurant’s menu, removing the “second mortgage” section and bringing back classic dishes from past menus. New cocktails are in the works, too. “Firsts” now include bison short rib with creamed celery root and roasted bone marrow served with char toast and lemon crumb. There are also classic firsts such as Yaya’s eggplant fries with powdered sugar and Tabasco sauce and a hot smoked salmon tostada with habanero crème fraiche. In addition, Rathbun is bringing back his sea scallop Benedict with country ham grits and chile hollandaise and the crispy duck breast with Thai risotto and green curry as entrees. Venison medallions with sweet potato lyonnaise will be available, too. Rathbun also took the temporary restaurant closure as an opportunity to renovate—the dining room has been repainted, the private dining room has new carpet, and the bar was refinished. 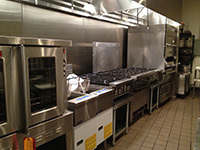 The restaurant now has all new kitchen equipment. “We’re just really happy to be coming back alive, and no one got hurt except me,” says Rathbun, who broke his ankle while assessing fire damage. He points out that the restaurant was able to keep the majority of its staff and has kept them busy with team-building activities, training at other restaurants, and field trips to farms, dairies, and Buckhead Beef. He says a grand re-opening party will be planned for October.